Lovely old trees… a perfect place for a relaxing walk…and my story continues . Whenever she felt agitated, angry, sad or confused, Lilian always went for a walk. Dreane Manor was surrounded by a vast park which turned into an old forest right outside the fence; she felt there at home, knowing every path and every bigger tree. As nobody had time to hear her out right now, she decided to go outside and transform her pent-up irritation into a brisk walking, breaking from time to time into a jog. She knew it would bring her a peace of mind and a clearer head. She didn’t expect any company but the company arrived. 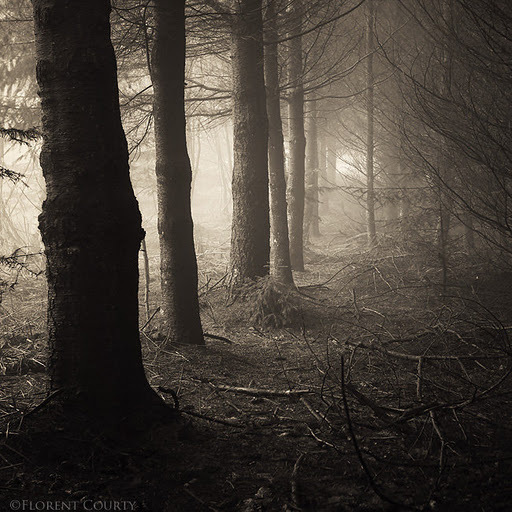 When entering the forest she glimpsed a slender silhouette approaching her fast. She thought it might be one of manservants running an errant but she was wrong. Henri the vampire joined her soon afterwards, as quick as a wind and as silent as an owl. One moment he was just a dark shadow in the background the next he was standing right behind to her. He bowed slightly and she answered with a curtsey – it would be rude not to acknowledge his greeting. Her father invited him to their house and he approved of him after all. “Mademoiselle? I hope I am not bothering you?” he asked shyly. “Pas du tout, monsieur,” she answered, proud of her school French. Henri simled but continued mostly in English. Lilian half laughed half snorted, too agitated to care whether these sounds were actually ladylike. The words broke a metaphorical dam in her head and her outrage started flowing round her body like a strong current. She kept walking faster and faster as she talked but the vampire didn’t have any problem with following her. “Would it help if I offered you some explanation, then?” asked Henri quietly. She stopped walking and turned to him. Henri gave an almost silent chuckle and Lilian blushed. Bad choice of words. The question made her almost gag. She wanted to know so many things but she had to start with something simple. The first set of questions was formed even before she realized that it might be a bit too personal and revealing. Henri smiled but his smile turned a bit wistful. All of the sudden Lilian blushed even more profusely. She couldn’t pronounce the word “lover” in front of a total stranger, vampire or not, especially having a pretty good idea what had happened in one of the smaller sitting rooms in her manor. The conversation made her wanting to run away and hide like a child in a closet. His honest response put her at ease quicker than any brisk walk would do. “What does it take to build a vampire coven?” she asked, almost perfectly calm now. Lilian felt perfectly at ease now, her previous embarassment completely forgotten. She was full of questions and she had somebody well-informed and willing to share his knowledge. The calm, peaceful manner of Henri influenced her mood. As they got immersed more and more in the discussion their jog turned into a walk and then into a slow stroll. What did you expect? Do you want to kill me? Fluff and passion might come…later. Lilian is one careful girl! Oh-oh. Sounds like she's getting a little too close to the vampire. carol – she is a bit too curious for her own good but, on the other hand, her dad is a bit quilty as well.Melissa, be careful my dear, you might get whipped for such suggestions! I thought he would bite her head off. LOL! And people think you're violent. 😀 MWAH HA HA! Excellent story, dear! A great idea, you know…he might bite her head off later *evil grin* Thanks anyway!Or somebody else's head…I must think about it seriously!